Andrew Leslie, Secretary, BIHIP Sycamore Group. Much of the hardwood resource in Britain and Ireland is of poor quality, the wood being suited only to lower value products. This represents a wasted opportunity, given that fine hardwood logs will have a value considerably greater than that of firewood, by volume. The importance of producing high quality broadleaves to the viability of forestry in the UK and Ireland is recognised. In September 2000, the British and Irish Hardwoods Improvement Programme (BIHIP) was launched with the overall aim to “improve the vigour and quality of the basis planting stock”. Sycamore, despite being a naturalised rather than native species, is considered particularly attractive for tree improvement due to its high value, rapid growth, the high levels of biodiversity of certain organisms, such as lichens, that it supports and the high biomass of aphids, which provide an important food source to a variety of organisms. One of the Group’s strengths is that its members have diverse backgrounds. Members include timber merchants, foresters and researchers specialising in tree improvement. The Group meets twice a year, with meetings being used to co-ordinate activities but also to visit stands of exceptional Sycamore. To date, a number of stands have been visited by the Group, seeing some impressive ones at Lowther (Cumbria), Bolton (Yorkshire), Leighton (Wales) and Farnley Hall (Yorkshire). 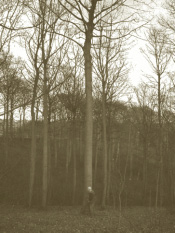 The quality of the best trees in these stands has reinforced the view that there is considerable potential for the development of “super Sycamore”. There are exceptional trees of Sycamore in Britain and Ireland (above) and these are known as “plus trees”. The seed, or vegetative material from these trees will be used to create seed orchards that in time will provide growers with superior seed. This is a long term programme with seed being available in 15 years from breeding seedling orchards but earlier if grafted clonal seed orchards are developed. Currently, 65 plus trees have been identified out of the target of 150 trees. Of these, scions (one year old shoots) have been collected from 44 trees to be grafted and raised as transplants at either Kinsealy, Ireland, or East Malling Research, Kent (right). The aim is to produce clone banks of the plus trees at each location, as an insurance against some catastrophic event eliminating all clones at one location. Over the next two years, the intention is to locate and collect material for a further 85 plus trees and to register a further eight seed stands. In the longer term, landowners interested in establishing seed orchards on their land will need to be identified. Although the collection of material from plus trees is focussed on Britain and Ireland, material from other countries is being considered. Visits to countries such as Denmark have shown that there are superior trees overseas. In addition, provenance trials established by the Forestry Commission in the early 1990s, have shown that local British and Irish provenances are not necessarily the best in terms of growth and survival. Being a naturalised species, there are not the biodiversity conservation pressures to use material that is native to the UK and Ireland. During plus tree selection, stands of superior quality are also being recorded. The group intends to assist landowners of these stands with their registration as seed stands by paying the registration fee required by the Forestry Commission. These will provide a valuable supply of seed from well-adapted, good quality trees in the short-term until the improved seed from seed orchards becomes available. To date five potential stands have been identified; two at Bolton Estate, two at Farnley Hall Estate and one at Castlemorris in Ireland. Members of the Group are also taking an active role in the initiatives focused on the control of the grey squirrel which poses a considerable risk to the creation of a high quality resource of British and Irish Sycamore. Michael Carey and Charles Dutton in particular, have been active in the European Squirrel Initiative. The Group has been fortunate in being provided with support from COFORD, Coiltte, The Forestry Commission, Forest Research, Woodland Heritage, Teagasc, and Northern Ireland Forest Service. However, some £12,000 will be needed over the next two years to locate and collect material from plus trees, while additional money will be required to maintain the clone banks in Ireland and England. The intention is to target some commercial organisations with a link to forests or indeed to Sycamore in particular for funds in addition to existing donors. Newer Post“Just one of those days"